With the Philips Digital Airfryer, you can eat healthier without giving up the taste and texture of your favorite foods. The Airfryer features unique Rapid Air Technology that circulates hot air with speed and precision for faster cooking and perfect results with less oil. Using the digital touch screen interface you can adjust the temperature up to 390 degrees and set the timer up to 60 minutes. The included double layer rack maximizes the Airfryer’s cooking surface letting you fry, bake, roast, and grill more of your favorite food. The Airfryer’s parts are dishwasher-safe for easy cleaning, and the included recipe booklet features more than 25 recipes created exclusively for the Philips Airfryer. 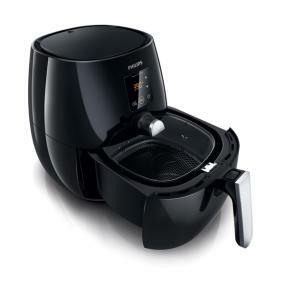 The Philips Airfryer is easy to use, with a digital touchscreen interface and dishwasher-safe pieces. Fry, bake, roast, and grill healthy foods with little to no oil. The Philips Airfryer makes it possible to enjoy healthier versions of your favorite foods by frying them with a tablespoon or less of oil and draining excess fat during cooking. Rapid Air technology circulates air around the entire unit, heating up to 390 degrees to ensure all food is cooked evenly throughout. Food becomes crispy on the outside and tender on the inside with little to no oil. In addition to its Rapid Air technology, the fryer’s unique starfish design on the bottom helps facilitate air circulation for evenly distributed heat, so your food cooks thoroughly and quickly with less oil. And, the Airfryer can do more than just fry. It can also grill, roast, and even bake your food, so you have more options when feeding your family or entertaining guests. Create everything from delicious cakes to tasty fried chicken with the Airfryer. Customize the settings to cook your food exactly as you want. The Airfryer’s integrated timer allows you to pre-set cooking times of up to 60 minutes. The fully adjustable temperature control allows you to pre-set the best cooking temperature for your food up to 390 degrees. Enjoy crispy golden-brown fries, snacks, chicken and more, all prepared at the right time and temperature for the best result! When the timer hits zero, the fryer shuts off automatically to prevent your food from overcooking and a “ready” sound indicator alerts you when cooking is complete. The fryer’s handgrips stay cool-to-the-touch, and its non-slip feet help keep it in place as it cooks. 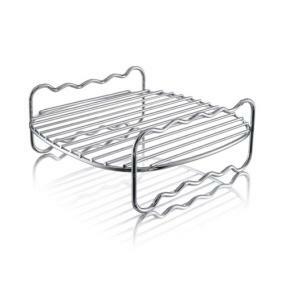 Created exclusively for the Philips Airfryer, the double-layer rack maximizes the Airfryer’s cooking surface and is dishwasher safe for easy cleaning.Cord storage located at the bottom of the appliance keeps things tidy and organized. Exclusive double-layer rack maximizes the Airfryer’s cooking surface and is dishwasher safe for easy cleaning. Philips Digital Airfryer, Double Layer Rack, and Exclusive Recipe Book.